Depicted is a representation of what a myelinated neuron looks like. The key to understanding diffuse axonal injury is understanding axons, and the role they play in neurosignaling and axonal tracts which link bundles of neurons. Axons are the long protrusions which leave the cell body of a neuron and transmit the signal of a neuron to other cells in the body. The axon is essentially the neuron’s wire, playing the same role as the electrical wire plays in connecting the light switch to the light fixture. There are two types of axons: myelinated and unmyelinated. The myelin is a type of insulation which helps to channel the electrical impulse more efficiently down longer nerve axons that connect the cerebral cortex (the outer part of the brain) to other parts of the body. The nerve cells within the cerebral tend to be shorter and do not have the need for this impulse channeling protection. 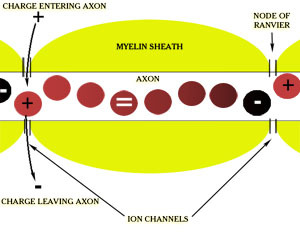 Shown is a simple graphical depiction of how the signal moves down a myelinated axon. Unlike electrical insulation, the myelin is not a continuous coating, but contains individually separated glial cells. The glial cells are laid end to end over the length of the axon. The glial cells resemble rolls of toilet paper, with the glial material wrapped many times around the core tube of the axon. And just as if you were to stack rolls of toilet paper on a broom, at each juncture between one glial cell and another, there is a small gap in the insulation. These gaps, called the Nodes of Ranvier, also serve an important purpose, allowing energy to enter the axon to boost the electrical signal as it traverses the length of the cell. 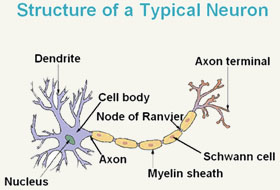 Between each portion of the myelin sheath are gaps, which are ion channels, called the Nodes of Ranvier. The ion channels allow electronically charged chemicals to reach the terminal end, which then creates an electrical charge , moving the electrical signal down to the axonal bulb at the end of the cell. From the axonal bulb, the signal then crosses the synapse to reach the next cell. The positively charged ion will lose its charge as it moves down to the next node, where it will have its signal boosted again. Axons are microscopically small, yet they run throughout the brain and the nervous system in groups, called axonal tracts, which can be see by the naked eye.